It's taken me a few days to get some decent photos, but I can finally share my April sweater with you! This is a brilliantly written pattern. At first glance, it's quite a bit different from an ordinary sweater pattern. Rather than listing the numbers for each size in order in a sentence, Heidi uses tables with all the relevant numbers. This makes it really easy to look down one column to see all the numbers for your size and less likely that you'll read the wrong number. The construction is pretty darn clever as well. The sweater is a top-down raglan, but the raglan increases are only done on the sleeve stitches. On the fronts and back, the increases are done in the form of eyelets (yarnovers) every eight rows or so. After dividing off the sleeve stitches, the back and draped fronts are shaped with a series of short rows, which you can see in the photo below. I had a bit of a thrill when I got to the bottom of the body and read the instructions for working the trim on the neck. After binding off the trim on the bottom, the pattern says to keep the last stitch live and on the needle and immediately turn the work to pick up stitches along the neckline -- almost the same technique I used in Ellyce. That made me feel pretty smart. The sweater was a surprisingly fast knit considering that the yarn is sportweight and it was knit on relatively small needles. The top part is very addictive, as you can't wait to get to the next eyelet row. Then when you get to the short rows, you don't want to put it down until you've finished the entire section. The sleeves really flew, and they were probably a little faster because I worked them in the round rather than flat as instructed in the pattern. There's a good reason for working them flat -- the rest of the sweater is worked flat, and working the sleeve flat and then seaming them would guarantee that your gauge won't change. My gauge isn't so different, though, and I'm happy to avoid seaming when I can. I did pick up an extra couple of stitches in the underarm and decreased them away in the first round to avoid holes, and I also lengthened the sleeves to full length (if I'm cold enough to wear a sweater, I want it to cover everything). This won't stop me from using the yarn again, though, and I'm looking forward to using the worsted version, Columbia, for a sweater in the future. So, now April's sweater is done and I'm ready to start the next one. Tomorrow, as it's May 1, I'll be casting on for my Gnarled Oak Cardigan for the Mad May knitalong. I dutifully knit and washed my swatch over the weekend, and it looks like I'll be using my size 4s again. My gauge is a tad off (I'm getting 22 stitches over 4 inches rather than the called-for 24), but the fabric is nice and firm and this gauge will allow me to knit the 35.75" size and have it come out closer to my actual bust size with very minimal negative ease. I didn't do anything special to the fiber beforehand; I just undid the braid, folded the length of top in half, and tore it apart at the fold point. I happened to make the split in the middle of a stretch of one color, so I spun one half starting at the split and the other half ending with it to try to avoid having that color plied with itself. Frankly, I was a little surprised at how often this color matching I was trying to avoid happened serendipitously, as I was expecting much more barberpoling. The skein looks to be about sportweight and is 196 yards. I think I might have gotten better yardage had I not put quite so much plying twist in. I generally like a lot of twist in my yarns and regularly have a twisty skein when I pull it off the niddy noddy, but most of the time the twist evens out in the wash. Not so this time. In fact, if you look closely, you can see a little corkscrew coming off the back of the right side of the skein in the photo above. I could run it back through the wheel to take out some twist, but realistically I'm unlikely to do that (I'm too lazy to ball it up, run it through the wheel, reskein, and rewash when I could just move on to the next thing). Speaking of the next thing, it's already on the wheel. This is the rest of the Crown Mountain Farms corriedale pencil roving I used for my experimental sock yarn. I'm spinning it into a 2x2 cabled yarn, so I'm spinning an ounce at a time. While I've gotten better at spinning thicker singles and yarns more recently, it's nice to know that I can still go back to my default superthin singles. My fingers know how to do it so well that I was able to do everything you see on this bobbin last night while watching a (subtitled) foreign film! I am so close to finishing my two main projects on the needles. I spent all of my knitting time last night working on my second Vitamin D sleeve, and as a result, I now have approximately 40 rounds to knit before it's done. I was a very good knitting and wove in all the other ends before I started the second sleeve, so as soon as I bind off, I'll have only two ends to weave in to be officially done with this sweater. Assuming that can happen tonight, it will have taken me exactly 28 days to knit this sweater -- not bad considering my knitting time is limited and this is a sportweight sweater. Fourth skein just joined last night! While I've been thinking about finishing this sweater, I've also been tending to my already-completed ones. The weather is now more reliably springlike, which means it's just about time to pack up my sweaters until the fall. I usually wash them all before I pack them away (to get rid of any dirt and body oils that might attract you-know-whats), so I started that process over the weekend. On Sunday, I washed my handspun aran and my Calligraphy Cardigan. Last night, my Blue Betty and my FLS went into the tub. I'm trying to wash sweaters together that are a similar color to prevent any dye bleeding, and two at a time seems to be a reasonable number. I have four "blocking towels" (old ones that I use to roll up the wet handknits) and am using two for each sweater. They get pretty soaked, and the sweaters take a couple of days (at least) to dry, so I'm aiming for two sweaters every other day. At this rate, I should have everything washed in two to three weeks. There's something so nice about going through all my handknit sweaters. In addition to the new sweater I will have in a matter of hours, I'll also soon have a new pair of socks to work into the rotation (because while it's no longer really sweater weather, my feet are still cold most of the time). My second Rubus suberectus sock is cruising down the foot and should be finished by the end of the week. I can usually get about two repeats of the stitch pattern done in one lunch break, and I have only 2.5 repeats (plus the toe) left to do. With these two projects about to be wrapped up, the natural question to ask is, of course, "What next?" I can't cast on for my Mad May project until next week, though of course there's some swatching to do. My lunchtime knitting will become socks out of the experimental handspun, which will be fairly simple (basic stockinette, though I'm planning to do something to the sock knit with the opposing ply yarn so that I can tell them apart). As to the bigger project, I think I've convinced myself that I should spend the next week working on my handspun Breezy Cardigan again. The last time I picked it up, I had finished the body and started the first sleeve. There really isn't all that much knitting left to do -- two sleeves and the ribbing on the fronts and around the neck -- but I find that I get bored with this project if I work on it for two long (mainly because progress is so slow even when I put in a lot of time on it). I would really like to finish this at some point this summer so that I'll have it ready to wear in the early fall. I think if I can work on it in small chunks of time as a way to break up longer stretches on other projects, that might actually happen. I promised I would give a recounting of my lace shawl design class with Kirsten Kapur, and I don't want to disappoint. In a word, the class was fantastic. I didn't expect three hours to fly by as quickly as they did, but I think all of us in the class were surprised when we realized we'd reached the end. I think that's the mark of a great class. The purpose of the class was to explain how to use the basic construction of a top-down triangle shawl and a lace stitch pattern to create our own shawl design. Kirsten started us off with a basic stitch pattern, which we first had to chart from written instructions. They she explain to us how to embed that stitch pattern into the chart for a top-down triangle, including how to make adjustments so that it would be centered. Once we got the hang of that, we all pulled out our stitch dictionaries to find a stitch pattern we wanted to try and started to chart it (using positively enormous 11x17 graph paper!). As soon as we had enough of the chart filled out, we could pull out yarn and needles and begin swatching. It's clear to me that this yarn isn't cutting it for this stitch pattern (it's Cascade Heritage Sock that I had leftover from a pair of socks I made for Rainbow and was the easiest thing to grab because it was accessible and already wound), so I'll be starting over with something better, but considering how I usually need to work through something to understand it, this swatch was invaluable. The real revelation in this class came from understanding how to balance the stitch pattern in the chart. I'm still working on figuring out when I've reached the end of the chart (and I haven't even begun to try to transition to another stitch pattern), but I feel like I'm well on my way. Kirsten gave us a great handout that I need to sit down and read through in detail and recommended a number of resources. As much fun as the class was, the afternoon was arguably even more fun. Apparently the class that was scheduled for the afternoon didn't have enough people sign up, so it was cancelled. Instead, Kirsten pulled out all the samples she'd brought and spread them around the shop, and then we all sat down and knit together. It was a bit surreal to be sitting and chatting (as I normally do on a Saturday afternoon) with a big-time knitwear designer, but she couldn't have been more down-to-earth and nice. If you have a chance to take a class with her, do it! I undid the braid, folded the length of top in half, and broke it apart at the fold line. Then I spun up the two halves. I decided on a two ply because I thought it would keep the colors more distinct. The fiber was such a delight to spin. I started spinning on Friday night, finished up the first bobbin and started the second last night, and then finished the second today -- probably less than four hours of spinning time total. The fiber was prepped so beautifully that it drafted with ease and I went into total autopilot spinning mode. This fiber was so beautiful as it was spinning up, and unfortunately the really vibrant colors are hidden underneath the top layer of these bobbins. I can't wait to see how this looks plied up! I finally made it out to knit night last night -- I hadn't been in a month -- and it was so nice to have some dedicated, uninterrupted knitting time. I made decent progress on sleeve #1 of my Vitamin D, although it seemed like the sleeve was going a lot slower than the body went. I had to knit to 8 cm before I started the decreases, and it seemed like it took most of the time I was out to get to that point. Now, however, I'm two sets of decreases in (out of a total of eight) and things seem to be moving more quickly. I'm working the sleeves in the round (the pattern has them written flat and seamed, which I really didn't see the need for) and will probably extend them to be full length rather than three-quarters. I'm also zooming ahead on my socks and have finished the leg and started the heel flap of sock #2. Now that I've got the pattern memorized and don't have to refer to the chart, I can get in a few extra rounds during my limited knitting time at lunch. I'm anxious to have a new pair of socks in the rotation because, shortly after publishing my last post, I realized the socks I was wearing were developing thin spots in the exact same spot in the heel flap. This really surprised me, because these socks aren't as old as the others and did have a reinforced heel -- not to mention that I didn't wear them all that often (largely because they've always been hard to get on, not having much stretch, and always felt a little crunchy to me). As much as I'm anticipating having a finished sweater (which I'll need now that the office air conditioning is on at full blast) and a new pair of socks, what I'm really getting excited about is my lace shawl design class with Kirsten Kapur this Saturday at my LYS. It's a three-hour class, so there should be a lot covered. Designing lace has always been one of my personal goals and I'm really excited to see what I can do after the class is done. I have a huge pad of graph paper, colored pencils, and stitch dictionaries at the ready. Expect a run-down of the class after the fact! Postscript: I want all of you who have encouraged me to darn the socks (or even offered to do it for me!) to know how much I appreciate it, but it isn't going to happen. Assuming I still had the small bits of leftover yarn that corresponded to these three different dyelots, I'd have to find them in the stash -- a Sisyphean task if ever there was one. Frankly, I'd much rather repurpose what's left of the socks and knit some new ones. There are so many full skeins of sock yarn in my stash that have been waiting for years to be used! This is officially the first pair of wool socks I've ever worn out, but I'd say that six years is not a bad life for them. I can think of several reasons why these would wear out where they did. For one thing, the heels of these socks are not reinforced (i.e., the heel flap is just plain stockinette). These may also have been knit at a gauge that wasn't tight enough for durability, and to add to it, Koigu is a two-ply yarn, which isn't the most durable construction for a sock yarn. And, of course, Koigu is 100% merino -- no nylon for durability. They were lovely socks to knit and wear, though, so I'm not sorry that I made them. I don't know for sure if Koigu is superwash, so I may try throwing these in the washer and dryer to see if they'll felt (and then I can use them to make a toy or something). On the upside, my Vitamin D looks like a real sweater now! I finished the body border last night and picked up for the neckline before bed. I have about four more rows of garter stitch and a bind off to do on that and then all that's left to do is the sleeves. Think I can finish this by the weekend? 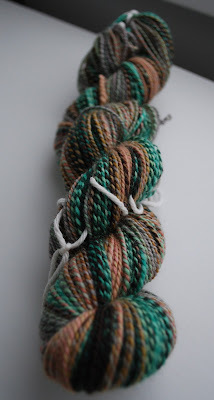 Given how uneven the singles were, I'm actually pleasantly surprised that the finished yarn looks as nice as it does. Sure, there are still some uneven parts, but overall, it's a pretty round, bouncy three ply. It's also super bulky (at about 6 wraps per inch) and a whopping 94 yards. I don't think I'll be rushing to spin this fiber again, but I will say that by the third bobbin I was starting to get the hang of it. I also managed to do pretty well with my singles control while plying; when I'd finished plying everything, I had about a yard of singles leftover, so I definitely maximized what I had. This is the March/April shipment for the Bee Mice Elf fiber club, a superwash BFL in a colorway called Hazy Days. I'm still undecided as to whether I'm going to spin this as a two ply or a three ply; for now, I'm just content to look at it and pet it! I have a confession to make: I've barely touched my Vitamin D since my last post. There's a good reason for this, I promise, and it has nothing to do with the sweater or my interest in it. On Tuesday, I got a movie in the mail from Netflix that I knew would not appeal to the Mister at all (Mao's Last Dancer, if you're interested -- it has ballet and subtitles, so that's a double whammy as far as he's concerned). That meant that I'd be watching it on my laptop with my headphones, and as my laptop is usually set up next to my spinning wheels, that meant sitting in my spinning chair. Now, I suppose I could have knit there if I really wanted to, but usually when I watch something on my laptop it's when I'm spinning. And I thought it would be a good opportunity to get through some of that fiber that wasn't spinning up so well. I was able to finish up the first bobbin's worth and make a good start on the second. I didn't get to start the movie early enough on Tuesday night to watch it all before bed, so I finished it up last night (and got to my third bobbin in the process). The movie was good and I'm happy with the spinning progress I made, but I didn't sit down to work on my Vitamin D until after 9 last night. Since you saw it last, I've added two more straight rows and the first radial increase row for the body. I will show it to you again when it looks significantly different; I'm hoping to put in a lot of time on it this weekend. I did, however, finish a sock! This is the first Rubus suberectus sock; I finished up the toe at lunchtime today (though unfortunately I completely forgot to put the second ball of yarn in my bag so I couldn't cast on for the next one). Because of my crazy row gauge, I did have to modify the toe. I started at 1.5" less than the total length and worked the decreases every other row until I got to 18 stitches. I also worked one more row of the pattern before starting the toe (the pattern says to start it after completing a pattern repeat) because I didn't want to do the first instep decreases using a yarnover. I did something similar on the leg before starting the heel flap. This sock took me a decent amount of time to knit considering how quickly I've knit some in the past, but now that this one is done I've got the stitch pattern pretty much memorized, and I think the second one will go a lot faster. I've really enjoyed the pattern and have even preordered The Knitter's Curiosity Cabinet, Volume II (there's a pretty good deal on the print book plus digital edition if you order right now -- you get a couple of free individual patterns, too!). I may never have time to knit all the patterns in these books that I want to, but they sure are beautiful to look at! I am continuing to plow through my Vitamin D at a rate that's somewhat astonishing to me given the limited amount of time I have to knit each night and the fact that I'm using sportweight yarn on size 4 needles. Last night I finished the second and final short row section of the body, though "short" is a bit of a misnomer when you consider that each short row covered most of the body stitches (by the time I finished the last set, I had only 6 stitches unworked on each side). Still only on the second skein! I'm at the point now where I have to work a couple more rows on all the stitches and then I'll start the yarnover radial increases again. I believe I have four sets of those to do in total, with plain rows in between, and then the edging (for which I may need to buy another needle, because I don't think I have a size 3 long enough to hold all these stitches comfortably). I'm very confident that I'll have no problem finishing this sweater by the end of the month. Meanwhile, during my lunch breaks, I'm still working on my Rubus suberectus socks, which are going much more slowly than I expected. The problem isn't the stitch pattern, which I've now got memorized and can do much more quickly. The problem is that my row gauge has gone crazy. Usually, I get 10 or 11 rounds per inch on my socks; for these socks, with this yarn, I'm getting 13 rounds per inch. I really love the squish and the stitch definition I'm getting with this yarn, but it shrinks up into really short stitches. I figured out that with my gauge, knitting the toe as written is going to cover only 1.25 inches. So I may revise the toe a bit so it doesn't look quite so funny and short on my foot, especially because I have some unusually long toes. I love fast spins. My default yarn is not fast, so it's always a thrill to me when I can manage to spin something thick (relatively speaking) and it takes only a fraction of the time. My most recent yarn took me about a week, though that's a bit of an overstatement because I didn't actually spin every day of that week. It was probably a total of four spinning sessions, so maybe 6 hours or so overall. I didn't overthink it, which was probably the key. I started with 4 oz. of Falkland from Gwen Erin Natural Fibers that I'd picked up probably a year and a half ago; the colorway was called Blue Danube. Rainbow selected this from my fiber stash to become a hat for her (incidentally, the lost hat it was intended to replace has since turned up, so I might end up keeping this for myself or saving it for next winter). I split this in half and then split one half in half again to do another fractal spin, though I don't think it's as obvious as the last time I did it because there is so little variation in the colors in the fiber. To give you an idea of how much spring is in this skein, I will tell you that my niddy noddy is two yards (72 inches) around, but after the skein dried, it measured only 52 inches around. Boing! I was watching last week's Masterpiece Classic episode on my computer while I plied last night and finished the skein before the episode, so I pulled out something else to spin. I decided to start the Crown Mountain Farms mystery fiber that arrived a couple of weeks ago. My first clue about the state of this fiber should have been when I pulled about the bundle to divide it into thirds: Rather than being in one long length of top or roving, I had at least three pieces of differing lengths. It took a bit of time, but I got it divided more or less evenly. Then I sat down to spin the first bit -- and I must say that I was really disappointed. The fiber looked so beautiful in the bundle, but when I tried to spin it, it was a bit of a disaster. I tried to spin it using my usual worsted style, but it wouldn't draft evenly (I'd pull out clumps at a time). Then I tried a modified long draw, and it would work for a couple of minutes before it would fall apart. I know it's a little hard to tell because of the color of the fiber, but the singles you see here are wildly inconsistent. I'm not happy with this fiber at all, but I'm going to do my best to finish spinning it -- as quickly as possible. I'm sure the finished yarn will be better than the singles, but I'm still a bit annoyed. This is not at all characteristic of the fiber I usually get from CMF, and I know that there was some concern about the quality of the fiber that kept it from being shipped out. When I'm done with this, I'm going to need to pull out some of the really good fiber I've been hoarding as a palate cleanser! Many thanks to those of you who commented on, favorited, and queued Ellyce -- and a huge thank-you to those of you who have bought the pattern! I never expected such love for something that basically started out as a selfish act (designing a sweater that I wanted to wear but couldn't find a pattern for). I finally had a chance to give my mom her finished Ellyce yesterday, and I think she liked it! Now that all the final work I needed to do to get the pattern ready for publication is done and behind me, I've been able to spend my evenings actually knitting again (thankfully, because my stressed-out brain much prefers knitting to crunching numbers). Even though I didn't plan it this way, I am on track to finish a sweater a month this year, assuming I can keep up my pace. I started my Vitamin D only a week ago and it's flying off the needles. I'm already more than halfway through the first set of short rows on the body. The pattern directs you to work the sleeves flat after you divide those stitches from the body (which makes sense, because the rest of the sweater is worked flat and gauge can change from flat to in the round), but I didn't want to have to sew up any seams, so I put those stitches on waste yarn, cast on stitches for the underarms, and proceeded with the body. Yes, it can be a bit cumbersome to have to deal with the weight of the body when you're knitting sleeves, but sleeves are much faster for me, so I'd rather get the long, more complicated body rows out of the way first. Last night I also broke into my second skein of yarn, which means I've already knit 400 yards' worth. Not bad! 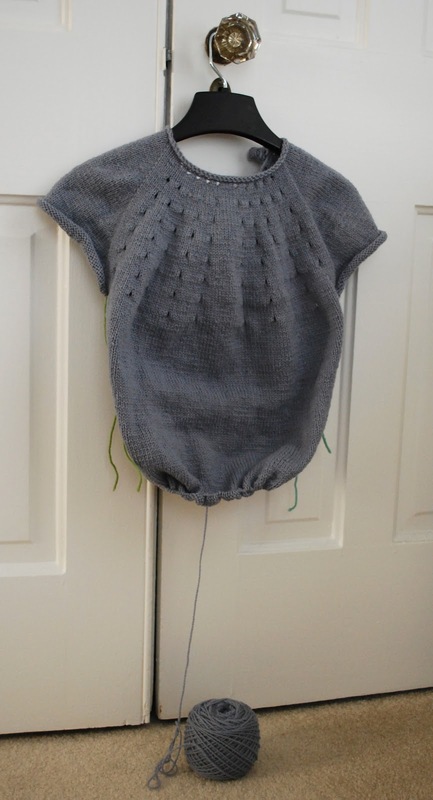 I am anxious to finish this by the end of the month because I am planning on knitting another sweater -- the Gnarled Oak Cardigan from Coastal Knits -- in Tosh DK next month for the Madelinetosh Lovers group's annual Mad May knitalong. I know that I'm capable of getting a sweater done in a month now, and it shouldn't be a problem considering how much knitting time I'll get in over the trip down to MDSW! Back when I started designing, I focused mainly on accessories, in part because that's what I really love to knit. Since then, though, I've really become a sweater knitter (I'm working on my fourth sweater of this year already), and I didn't feel like I could call myself a "real" designer until I'd designed a sweater. Well, that day has come. After months of knitting, doing calculations, doing recalculations, testing, tech editing, and so forth, Ellyce is finally live. 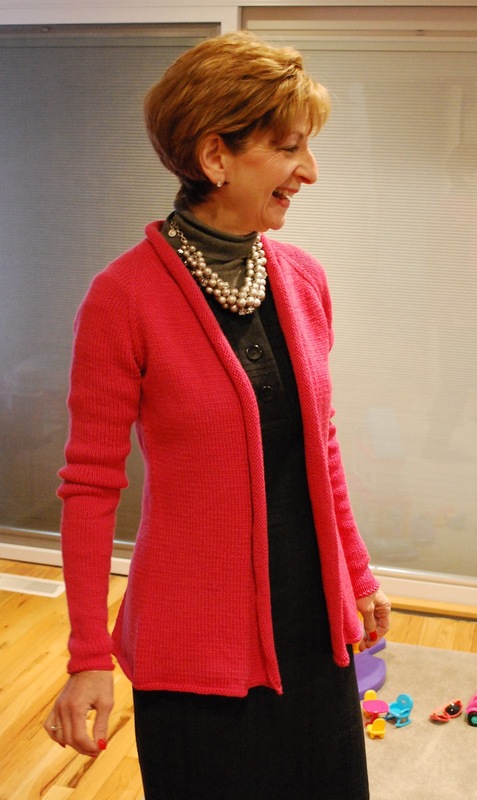 Ellyce was designed to be the sweater I always wanted to wear but could never find a pattern for -- simple lines, sleek, and cozy with just a bit of a flair. It's knit entirely seamlessly from the top down using raglan shaping. 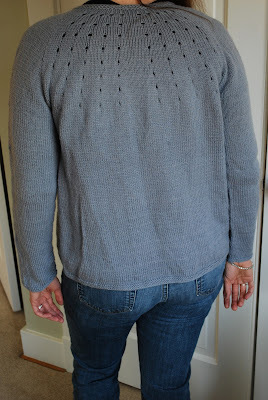 There is literally no seaming involved in this sweater -- the collar/front bands are picked up using the live yarn before the bottom of the sweater is finished, and the sleeves are knit in the round, so the only finishing you'll have to do on this sweater are weaving in a few ends. I know it's odd to release a sweater pattern in April, but it's actually very much still sweater weather here. This was designed to be a transitional piece -- something you can wear when you need layers or when it's just slightly too warm for a coat but not warm enough to go outside in just a shirt. In the photos you see here, I was wearing a light cotton shirt underneath and was pretty cozy even in the snow. The sleeves are long and fitted to keep out the chill, though if you don't like them that long, the length is easy to adjust (just stop knitting when you reach your target length). The rolled collar hugs the neck and hangs open on its own, but if you'd like to keep it closed, this is the place for a pretty shawl pin. I'm super excited about this release because I've learned so much about the process of designing a sweater -- it's hard work! I had a bunch of great test knitters and two tech editors work on this pattern, and their help was invaluable. I really hope you enjoy it!